Secret Invasion #1 Arrives Tomorrow – Who Do You Trust? Here are two more images courtesy of Marvel Comics asking that age old question, “Who Do You Trust?” The variant edition for Secret Invasion #1 shows Spider-Man in mid turn. I don’t know if that is a big reveal or not, but this latest by Greg Horn sure makes you wonder. Take the jump for the Spider-Man issue, plus one more that will blow you away. 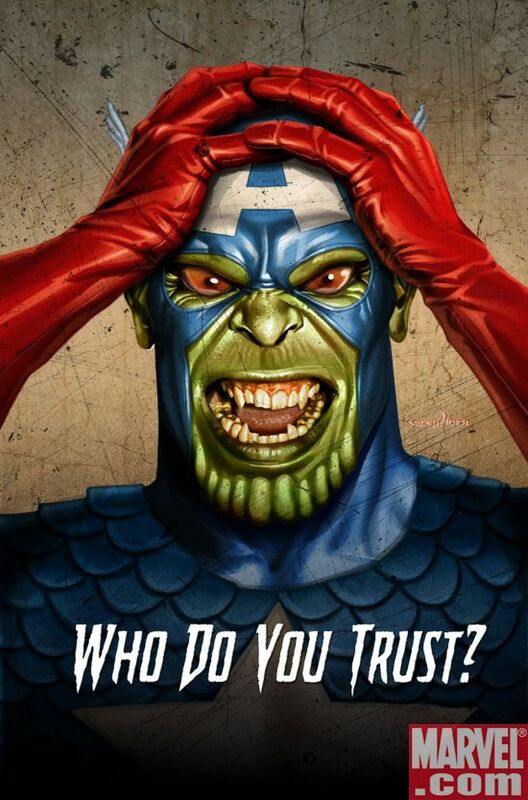 Wait – is that Bucky, or Steve Rogers, or Skrull Rogers, or Clone Rogers? Secret Invasion #1 arrives Wednesday. That is definitely Steve Roger’s uniform, since it has the scales instead of Bucky’s smooth metallic look. But, we won’t let a little thing like continuity get in the way of Marvel. I just can’t imagine they’d mess with Captain America or Bucky all THAT much since Brubaker is doing such amazing things in that book. But maybe thats just wishful thinking on my part. Will they stop with the horrible promotional stuff once issue 1 is released ? Or are they going to go through every Marvel character? You just want a Skrull Stevie Hunter promo. Oh, pish posh. If this Skrull isn’t just a cheap marketing gimmick, he’ll be appearing in SI as a Skrull impostor trying to psych the heroes…hence the hands on his head. I’d like to see this turned the other way, and start doing promotions of Kl’rt, Jazinda, Lyja, Paibok, Hulkling, and any other semi-significant Skrull characterized as normal humans. those aren’t Skrullcap’s hands, they’re Bono’s. Didn’t you know? U2 appears in Secret Invasion. What’s this Secret Invasion all about? I thought Who Do You Trust was a slogan for Trojan or something…. 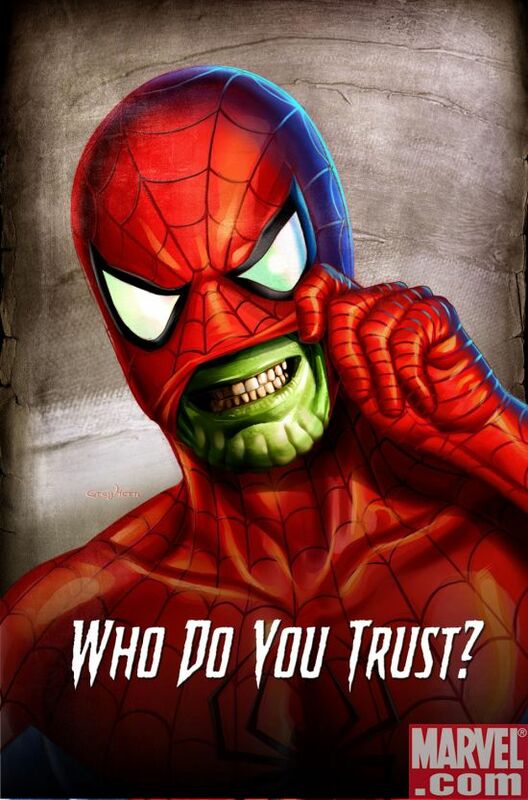 I think we need a “Who Do You Trust?” of Stan Lee. Also, it would have been far better if instead of “One More Day,” the Skrull imposter had been impersonating Ben Reilly as “Peter Parker,” with the real 16-year-old Peter Parker frozen at Skrull Invasion HQ for X number of years. Then you could reboot Peter to fit the damned movie continuity without having the character make uncharacteristic and immature decisions about his loved ones. he made the cap pic look kinda vintage dont ya think? with all the lines and crap, plus the old uniform. could cap have been the first one to be infiltrated?!!! who knows…. Actually, I believe that OMD does have some Skrull ties, since Bendis and Quesada seem to enjoy doing the out-of nowhere swerve on the readers. The pity of this is that it’s boring me. Neither this or “Final Crisis” has me exited. I just want both to be over. Between the Prequel, Entertainment Weekly’s exclusive look, and the spoilers on the Schwapp blog, issue one has been pretty spoiled for me. I’m still getting it because I think the covers are awesome (see: Zombies). Didn’t we see Steve Rogers’ dead body, thereby proving he wasn’t a skrull? If OMD was skrulled, we get into intense spiritual/metaphysical questions: Is one bound to a deal with a devil made by a imposter proxy? Or is it like identity theft where banks will not hold you responsible if someone steals your credit card? ‘Nother thing – Skrull-Spidey was in a similar pose and had a similar smile on the cover to “Secret invasion Saga”.